Whispers in the Loggia: "The Tragedy of Disinformation" – For Communications Day, The Pope's War on "Fake News"
"The Tragedy of Disinformation" – For Communications Day, The Pope's War on "Fake News"
Per custom on this feast of St Francis de Sales – the patron of writers and journalists – Roman Noon today brought the release of the Pope's annual message for the church's World Day of Communications, this time on a theme unusually ripped from the headlines: the rise of "fake news" and how to combat it. Always a broad-focus treatment of a recent development or trend in the media realm, each year's theme is chosen by the pontiff and announced on the feast of the Archangels (29 September) prior to the observance. The lone yearly event called for by Vatican II and first held in 1967, the WCD is marked on the Sunday prior to Pentecost (this year, 13 May) – now the transferred Ascension Day across most of the global church – reflecting Jesus' final earthly mandate to "go and teach all nations." Given President Trump's now-routine blasts of mainstream media as "fake news" – a term he once claimed to have invented – this year's theme is a particularly relevant one in the US context. While the topic is the same, though, today's message is not the one the West Wing would've written. 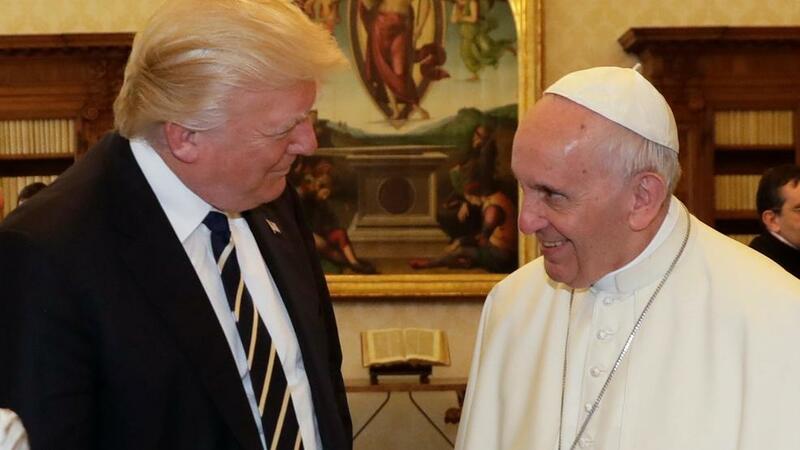 In that light, it bears recalling that Francis' most viral brush with a false "report" came in connection to the now-occupant of the White House – a 2016 article presented as "news," yet actually posted on a satirical website, claimed that the Pope had endorsed the presidential run of the New York developer and reality TV star. Even if the notion of a papal endorsement of any candidacy for any electoral office would've been an unprecedented breach of the Holy See's principle of non-intervention in the internal affairs of another sovereign state – let alone a possible violation of international law as said neutrality is enshrined in treaties – the non-story was shared almost 100,000 times on Facebook by an audience that either didn't know the critical context and took its veracity at face value, or amid the polarization of the campaign, simply wanted it to be true irrespective of fact. 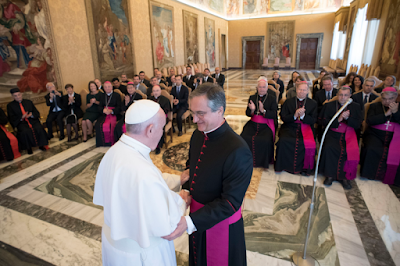 With the consolidation of the Vatican's varying media organs almost completed – and, thus, arguably the most successful piece of the Curia reform chartered by Francis – the handling of today's message now falls to the Secretariat of Communication, led by the cinematographer Msgr Dario Viganò (above, with Francis). Notably, however, in a marked contrast to years past, today's release was not accompanied by a full Press Office briefing on the text nor an appearance before the resident press corps by the Comms chief – a choice ostensibly made to side-step the inevitable questions on the "political" angle of the topic. All that said, here below is the English translation of the Pope's message: a text curiously capped with an adaptation of the prayer commonly attributed to St Francis, which isn't actually the case.